This data set contains field observations, corresponding GPS points, and points and polygons of deforested areas in the state of Mato Grosso, Brazil, for the period March 17-24, 2005. Fieldwork was conducted in the regions surrounding Sinop, Mato Grosso, with specific emphasis on large clearings occurring in the Xingu Basin. The field campaign was designed to validate preliminary MODIS deforestation products designed to detect deforestation during the wet season. There are five data files with this data set: four shapefiles (.shp) and one comma-separated file (.csv). KNOWN PROBLEMS: The methods used to acquire the data were not well documented. The exact connection of observations in the *.csv files to the shapefiles is left up to the users. These are the field observations used to validate MODIS land cover classification as described in Morton et al., 2006. This data set was archived in December 2014. Users who download the data between December 2014 and November 2019 must comply with the LBA Data and Publication Policy. The investigators were DeFries-Bajpai, Ruth; Shimabukuro, Yosio Edemir; Anderson, Liana Oighenstein; Coura, Samuel Martins da Costa; Espirito-Santo, Fernando Del Bon; Hansen, Matthew C.; Jasinski, Ellen W.; Latorre, Marcelo Lopes; Lima, Andre; Morton, Douglas; Piromal, Rodrigo Sbravatti and DeFries, Ruth Sarah. You may contact Morton, Douglas C. (morton@geog.umd.edu). This data set contains field observations, corresponding GPS points, and points and polygons of deforested areas in the state of Mato Grosso, Brazil, for the period March 17-24, 2005. Fieldwork was conducted in the regions surrounding Sinop, Mato Grosso, with specific emphasis on large clearings occurring in the Xingu Basin. The field campaign was designed to validate preliminary MODIS deforestation products designed to detect deforestation during the wet season. LBA-ECO LC-22 Field Validation of MODIS Deforestation Detection, Brazil, 2003-2004. MODIS field validation data for 2003-2004 in Mato Grosso, Brazil. There are five data files with this data set. This includes four shapefiles (.shp) and one comma-separated file (.csv). The data provide field observations and corresponding GPS points, preliminary data sets for MODIS deforestation detection in the state of Mato Grosso, Brazil for the period March 17-24, 2005.
deforestation_polygons.zip This .zip file contains a shapefile (deforestation_polygons.shp) comprised of five files ( *.prj, *.sbn, *.sbx, *.shp, and *.shx) and contains the estimated perimeters of 47 new deforestation areas (since August 2004) that were observed during the field campaign. logging_areas.zip This .zip file contains a shapefile (logging_areas.shp) with polygon geometry. The shapefile is comprised of six files (*.dbf, *.prj, *.sbn, *.sbx, *.shp, and *.shx). Four areas that were initially identified as potential wet-season deforestation were logged, but not completely cleared. These polygons are isolated in this shapefile as a means for validating future deforestation detection algorithms and to help characterize the spectral and temporal patterns of logging in remotely sensed data. covertype_march05.zip This .zip file contains a shapefile (covertype_march05.shp) with polygon geometry. The shapefile is comprised of six files (*.dbf, *.prj, *.sbn, *.sbx, *.shp, and *.shx). The shapefile contains 167 land cover type polygons of pasture and agricultural fields. Polygon boundaries were digitized over 2004 Landsat imagery to match field observations. Specific agricultural crops were recorded for each field where appropriate. These observations are specific to the field observation window--agricultural practices are dynamic and highly variable in Mato Grosso. Field notes are also listed in the table (.dbf) file for the shapefile. gps_points_march05.zip This .zip file contains a shapefile (gps_points_march05.shp) with point geometry. The shapefile is comprised of six files (*.dbf, *.prj, *.sbn, *.sbx, *.shp, and *.shx). Shapefile with the location of additional observations. gps_points_march05.csv: This file provides descriptions for each waypoint including latitude, longitude, date, and comments.projection /datum: WGS84 lat/long. The data set covers the period 2005/03/17 to 2005/03/24. Land cover polygons (crop type, pasture, deforestation, and logging) are designed for training and validation of deforestation detection and land cover classification algorithms. Wet-season deforestation observations are critical to evaluate the temporal dynamics of deforestation in this region. Data were checked for internal consistency, and observations at individual GPS point locations and polygons represented consensus from four observers. The methods used to acquire the data were not well documented. The exact connection of observations in the *.csv files to the shapefiles is left up to the users. These are the field observations used to validate MODIS land cover classification as described in Morton et al., 2006. The goal of this study was to develop, test, and validate simple and efficient methods for the annual or more frequent monitoring of deforestation in the Brazilian Amazon as a basis for prioritizing high-resolution analyses and characterizing recent deforestation dynamics. The focal area for the campaign was the region surrounding Sinop, Mato Grosso, with specific emphasis on large clearings occurring in the Xingu Basin. Figure 1. Tropical deforestation for cropland agriculture in Mato Grosso state (2001–2004) is concentrated along the existing agricultural frontier. (Inset) Location of the study area subset within Mato Grosso state and the Amazon Basin (Morton et al., 2006). Field data on the location and condition of deforested areas, pastures, and cropland were collected during March 17-24, 2005 and scaled from Global Positioning System point observations to polygon training data by digitizing feature boundaries on near-coincident Landsat Thematic Mapper (TM) data. Landsat TM data were provided by INPE before the field campaign and georeferenced to existing Landsat Enhanced Thematic Mapper Plus (ETM+) data provided by the Global Land Cover Facility with a spatial error of less than one pixel (30 m) (Morton et al., 2006). PRODES digital results of the annual deforestation increment mapped using Landsat TM data from approximately August of 2001–2004 for the state of Mato Grosso was used to identify the location and size of new clearings and summarize total deforested area. Our analysis was limited to new clearings greater than 25 ha based on the moderate resolution (250 m) of the MODIS sensor (Anderson et al., 2005, Justice et al., 1998, Morton et al., 2005). Estimates of 2005 deforestation in Mato Grosso State were generated from MODIS red reflectance data contained in the MODIS_Terra Vegetation Indices 16-day L3 Global product at 250-m resolution (Huete et al., 2002) and forest information from the PRODES 2004 deforestation analysis (Morton et al., 2006). For additional related information and data regarding the 2003-2004 MODIS field validation campaign, refer to the data set LBA-ECO LC-22 Field Validation of MODIS Deforestation Detection Products, 2003-2004. PRODES deforestation data, including remaining forest cover, for the Brazilian Amazon can be downloaded in shapefile or Spring format at: http://www.obt.inpe.br/prodes. Anderson, L.O., Y.E. Shimabukuro, R.S. DeFries, and D.C. Morton. (2005) IEEE Geosci Remote Sens Lett 2:315–318. Huete, A.R., K. Didan, T. Miura, E.P. Rodriguez, X. Gao X, and L.G. Ferreira, (2002) Remote Sens Environ 83:195–213. Justice, C.O., E. Vermote, J. Townshend, R.S. DeFries, D.P. Roy, V.V. Salomonson, J.L. Privette, G. Riggs, A. Strahler et al. (1998) IEEE Trans Geosci Remote Sens 36:1228–1249. Morton, D.C., R.S. DeFries, Y.E. Shimabukuro, L.O. Anderson, F. Del Bon Espirito-Santo, R. Freitas, and J. Morisette. 2006. 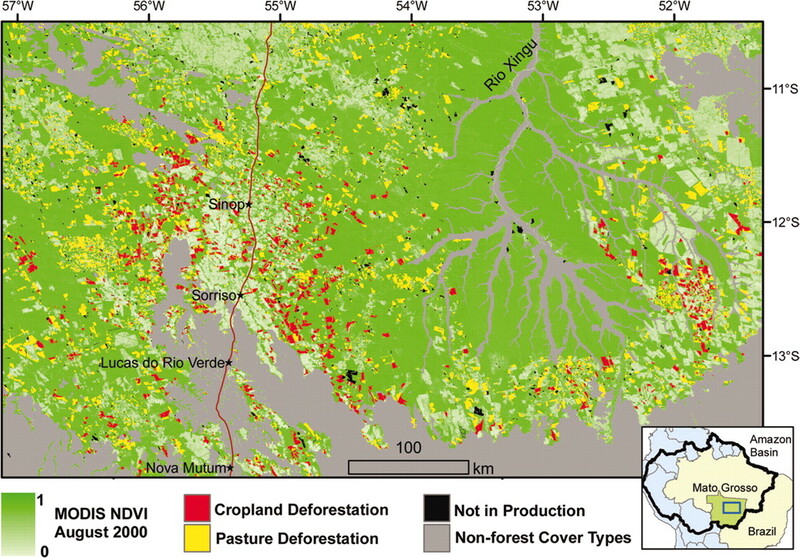 Cropland expansion changes deforestation dynamics in the southern Brazilian Amazon. PNAS, 103 (39) 14637-14641 doi:10.1073/pnas/0606377103. Morton, D.C., R.S. DeFries, Y.E. Shimabukuro, L.O. Anderson, F. Del Bon Espirito-Santo, M. Hansen, and M. Carroll. 2005. Rapid Assessment of Annual Deforestation in the Brazilian Amazon Using MODIS Data. Earth Interactions 9(8):1-22. Jasinski, E., D. Morton, R. DeFries, Y. Shimabukuro, L. Anderson, and M. Hansen. 2005. Physical Landscape Correlates of the Expansion of Mechanized Agriculture in Mato Grosso, Brazil. Earth Interactions 9(16):1-18.